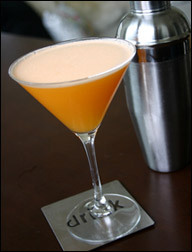 Devoid Of Culture And Indifferent To The Arts: Recipe: Oranges and cream and booze! Oh, my! I've discovered this in spades over the past week. It appears that posts that have been the most popular are those associated with booze. Now that's for one of two reasons. Either you're all latent alcoholics, or the posts are interesting and useful. Let's hope for the latter! 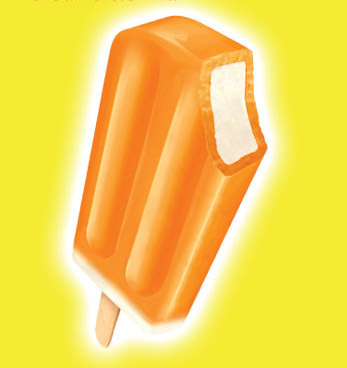 I was wandering around the inter-web a few nights ago and all of a sudden had a craving for a Creamsicle. You know, the real ones that come frozen on a stick. I believe someone mentioned them on TV. Even though I am in advertising and know the tricks, I'm obviously still easily influenced. So I found two recipes for Creamsicle Liqueur that sounded good. One called for gelatine which made the liqueur very thick (it said you may have to scoop it out of the container – huh? ); the other was a cognac based recipe that had no cream and was clear. It had an interesting infusion technique but how is it Creamsicle-y if it has no cream? Seems to be a necessity. Much like a brick house needs to be built of bricks. So what to do? If you're me, take the best from both, do some tweaks (from experience) and go for it. That's what you see in the recipe below. I have to admit, this tastes pretty good. Quite like a Creamsicle, for adults. One important note: I made this with 10% table cream. I changed the recipe to include coffee cream. It was a little thin for my liking. But you be the judge. You may want to have all coffee cream or all table. It works either way. I had to do the final mixing in two batches because of the amount this recipe makes, so the following directions reflect that. You could opt for making a half a recipe, but vodka comes in "pints" so why not make a full one. If making half, divide all ingredients in half (of course). 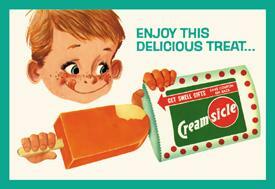 Just think, a childhood memory to warm your innards in the dead of winter, instead of giving you brain freeze! Last night I sampled a couple (smallish) glasses. The alcohol content is a little deceiving, so handle with care. But above all, enjoy!! My end result was not this orange coloured. Choose your oranges carefully. Before you buy, stick a finger nail into the rind and smell. It should have a very strong orangey smell. Intensity varies by time of season and variety. Rinse the oranges. Grate off the zest with as little of the white pith as possible. Place in a saucepan. Add the light cream and heat to just before scalding. Very light bubbles will form on the edge and steam will be coming from the surface. Remove from the heat. Cover with plastic wrap and refrigerate until chilled. This will take a couple hours. This process extracts some of the essential oils from the zest into the cream. You can let the mixture stay in the fridge overnight if you wish. Strain the cream to remove the zest. Combine half the cream with half of the remaining ingredients, blend well and pour into a container with a tight seal. Repeat with remaining ingredients. Note: I found that the six oranges produced slightly more than 1 cup of juice, so I used it all.